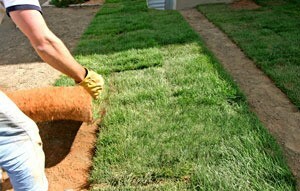 Laying sod is a quick way to add a lawn to your home. This is a guide about laying sod for a new lawn. Tip: When should I lay new sod grass? When should I lay new sod grass, fall or spring? As long as the ground isn't frozen or covered with snow, anytime is a good time to lay sod. Spring and fall both have the advantage of being moister months. The key to having sod take successfully depends a lot more on how well you prepare the site and aftercare than what time of year you lay it. Prepwork: The very first thing you should do is to have your soil tested. The results will tell you whether or not fertilizer or amendments need to be added to your pre work and if so, how much to add. To prepare for sod, start by removing all existing grass, weeds and large rocks. Next you'll want to dig up the top 6 inches of soil using a rototiller. If the soil is poor quality, till in an additional 3 to 4 inches of new topsoil into the existing layer. This is also when you want to add additional soil amendments you need and change the slope or drainage if necessary. About 1 week later till the area again and level it using a rake. 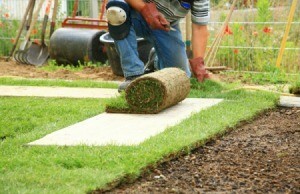 Install your sod as soon as it arrives. Aftercare: Until the new sod roots down into the soil, it's going to need regular watering so it doesn't dry and shrink. Plan on keeping it damp for at least two weeks and avoid walking on it as much as possible. After it starts to grow, set your mower blades higher for the first few cuts. I think it depends more on where you live and what type of grass you want to plant. Check the internet to see if your state has a county extension site, or call them. They will advise you on both. I live in the deep south, so grass can be set anytime down here. I have St. Augustine so if were to add sod, I would put it down in the spring opposite the dormant season, to take advantage of the rainy season and also give the roots time to set well.